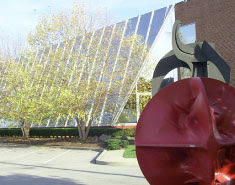 As home to the University at Buffalo’s permanent art collection, the UB Anderson Gallery is a museum that manages and exhibits the school’s visual resources and serves as a venue for scholarly exhibitions. The UB Anderson Gallery provides students with hands-on experiences in museum studies and arts administration while offering faculty and graduate students curatorial opportunities. Situated between the university and the larger Buffalo community, the UB Anderson Gallery has become a cultural crossroads and an important part of the Western New York arts scene. Located in University Heights, it plays a vital role in the community by offering innovative educational programs and working collaboratively with other local institutions to highlight collections and present scholarly exhibitions focused primarily on the post-war period. Future plans for the gallery include the creation of a prints and drawing study room and the development of the Martha Jackson Research and Archive Center.